Pickering is an ancient market town in the Ryedale district of North Yorkshire, England, on the border of the North York Moors National Park. Historically part of the North Riding of Yorkshire, it sits at the foot of the moors, overlooking the Vale of Pickering to the south. The town as it exists today is of medieval origin. 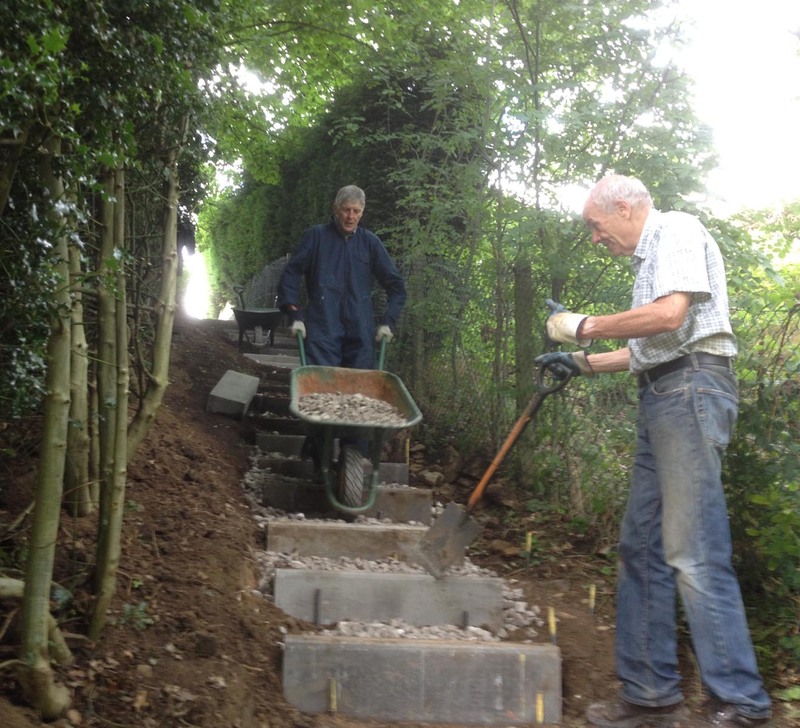 From Pickering there is easy access to the North Yorkshire Moors by road, bus or train. I hope to offer the 3 grades of walks on both days and would be grateful of offers to lead walks. I know the area quite well and will be able to help with suggested walks. This will be at the Forest and Vale Hotel. We shall have sole use of their attractive dining room. I will circulate a meal choice form in due course, the cost being around £26 for 3 courses and tea/coffee. There are many pubs in Pickering plus other places to eat but I can organise a group meal in the Forest and Vale hotel which will be simple. E.g. Pie and chips or Fish and Chips details to follow later. The hotel does meals in the brasserie/bar and it will be possible to arrange tables and times to eat. Forest and Vale Hotel – this is a very pleasant hotel situated on the roundabout between of the A170 and A169 close to the town centre with parking. They require us to occupy a reasonable number of rooms in order to have the main dining room on the Saturday evening. A double room for single occupancy is £20 a night cheaper per room. To book please contact the hotel 01751 472722 and mention ECR as they reserved rooms until the end of January for us to book. You will be asked for a deposit. 1. Black Swan – close by 9 rooms well reviewed and looked pleasant. Have a single at £70/ night or single use of double for £85. 4.Bramwood Guest house – fairly close slightly cheaper than hotel. 3. your email or other contact details so that I can send you the updates on the walks and the Meal. 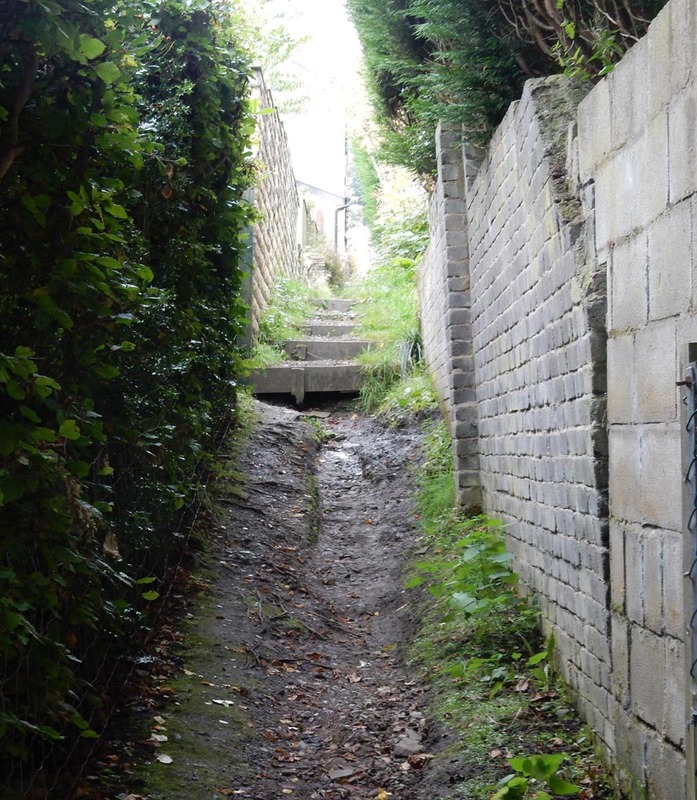 Ilkley is a spa town approximately 12 miles north of Bradford and 17 miles northwest of Leeds. The town lies mainly on the south bank of the River Wharfe in Wharfedale, one of the Yorkshire Dales. The town centre is characterised by Victorian architecture, wide streets and floral displays and it has a high number of small independent shops. It is also one of five towns to feature a Betty’s Tea room. Ilkley Moor, which overlooks the town, is part of Rombald’s Moor, which has the second highest concentration of ancient carved stones in Europe. 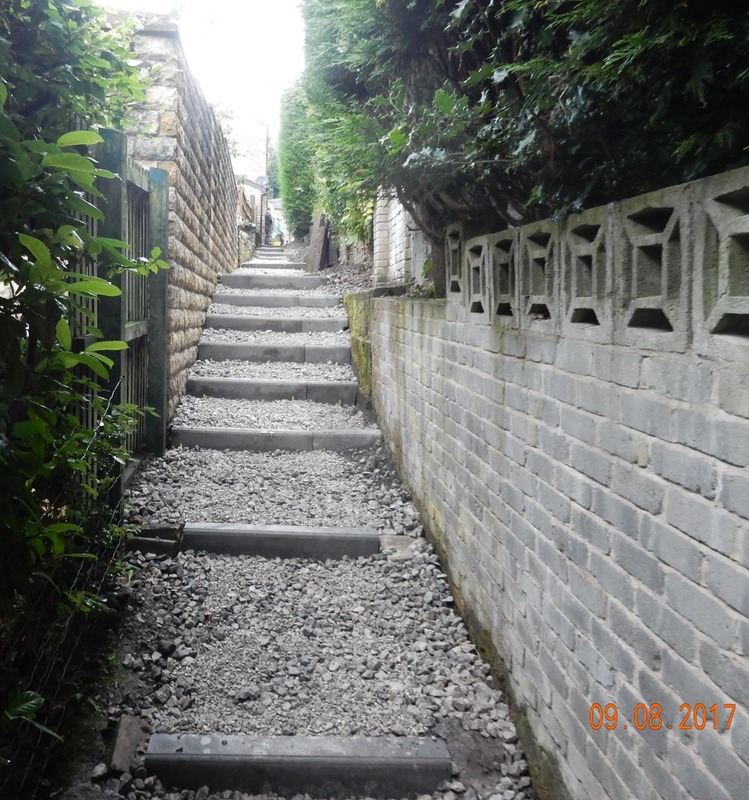 Set in 6 acres of beautiful, landscaped grounds and woodland, Craiglands is just a short walk from the town and the famous Ilkley Moor. I have visited the hotel and reserved 28 of the best rooms overlooking the valley. Please don’t believe all the reviews on some of the review sites! Reserve your hotel room through me using the attached form. Deposit: Pay £25 deposit per person: £20 non-refundable deposit for the hotel and £5 recce fee per person. Balance: must be paid to ECR by Wednesday 1st May. I will remind you a couple of weeks before this is due. Please complete the attached form and pay your deposit and recce expenses as soon as possible. The hotel “rooms with a view” will be allocated on a first come, first served basis and will be held for ECR by the hotel until 5th April However, once the 28 rooms have gone, I cannot guarantee what rooms will be available, if any. If you don’t want to stay in the hotel, you are still very welcome to join us. Please complete the attached form as I will need your contact and emergency contact details and £5 recce expense payment. The hotel is very happy for you to join us for any of the evening meals at a cost of £25 per head. We hope that everyone will join us for the traditional Saturday night get together meal. We hope to offer short, medium and long/long-medium walks on Saturday 15th and Sunday 16th June. This will be confirmed once walk leaders have been identified. If anyone is interested in leading a walk, please let me know. I’m looking for short and long leaders. 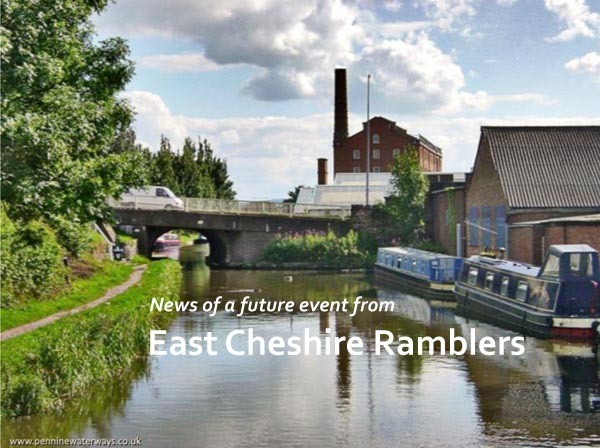 One of the many highlights of the East Cheshire Ramblers’ programme is their regular weekends away. This year the group went to Coniston for the weekend. It is a fascinating area with old copper mines and slate quarries. The majority stayed at the excellent Waterhead Hotel with beautiful views of the lake and a few others found their own accommodation. 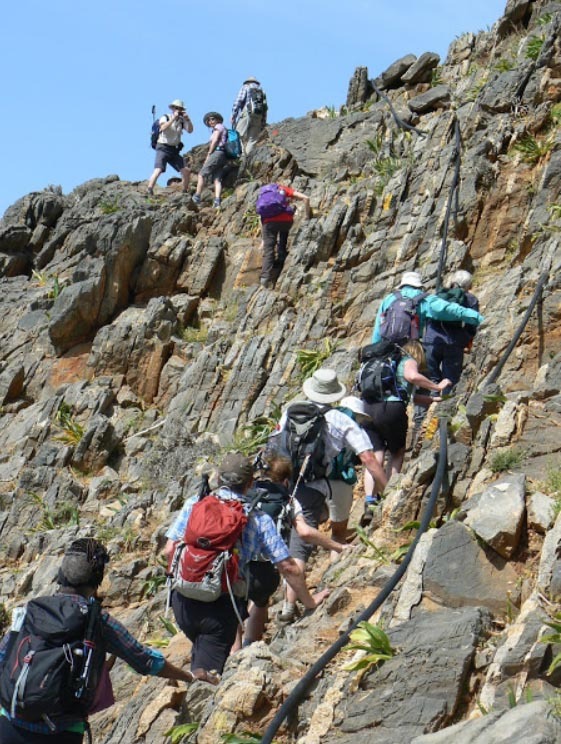 Three walks were organised on both Saturday and Sunday of varying lengths and difficulty to cater for everyone’s requirements. Much to everyone’s delight and relief, the weather was absolutely wonderful all weekend. 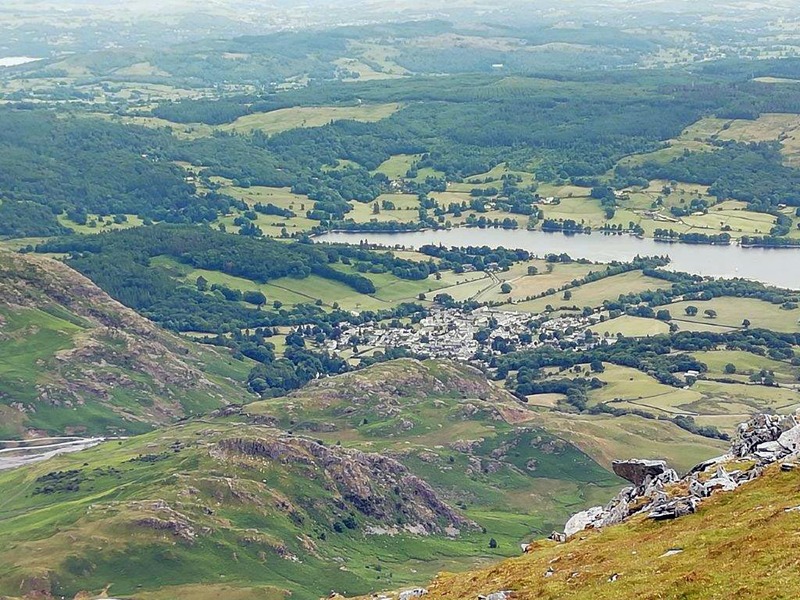 On the Saturday, 16 intrepid walkers set off to climb the Old Man of Coniston. Rather having an immediate ascent they walked along an old railway line above the Lake before walking gently upwards through fields of pasture and eventually meeting the Walna Scar Road. There are several routes to walk up Coniston Old Man (803m) and they choose a path leading us to Low Water a glacial basin, before completing the final ascent. They enjoyed stunning views, stopping for lunch above Levers Water with distant views of the Fairfield Horseshoe, the coast and estuaries. Taking an easy path along the top they reached Swirl How with more views of the mountain tops of Bowfell and Scarfel, from here they started their descent using a rocky path before reaching Wetherlam and walking down a long grassy slope back to the Miners Bridge and Coniston. Twelve walkers set off up Walna Scar road, which climbs steeply to a remote car park used by walkers wanting to climb the Old Man, but without the initial slog! They then had a beautifully scenic walk back down to Coniston via Torver Beck, Torver Village (with its bizarre phone box converted into a fish tank) and along the lake. The final 10 caught an early bus to Blawith, and ascended via Beacon Tarn to Blawith Fell (820ft) and then descended and walked the path along the whole length of Coniston. 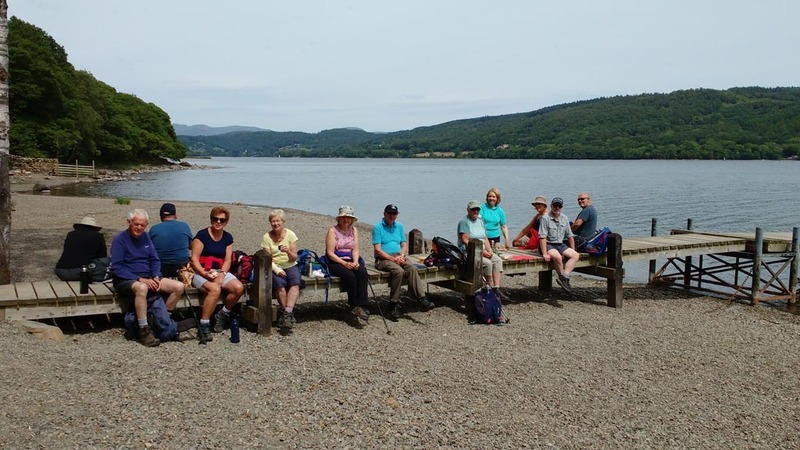 They too had panoramic views and finished their walk following the lakeshore path into Coniston where they stopped for tea at the Bluebird Café by the lake. Descending from Blawith Fell on the short walk on Saturday. 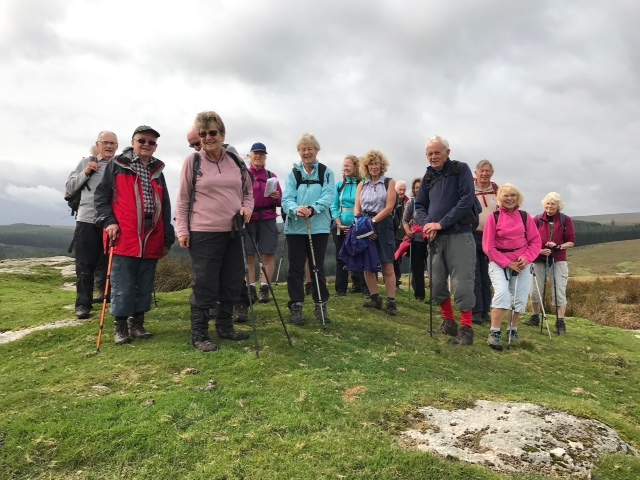 As well as being exhilarated by the panoramic views the long walk participants were able to inspect evidence of the area’s industrial past and discover a link with our home town of Macclesfield. In the 18th century there were three areas of copper mining which employed 600 men, women and children. The ore was transported to smelters In St Helens and Swansea by horse and cart and boat and finally rail. 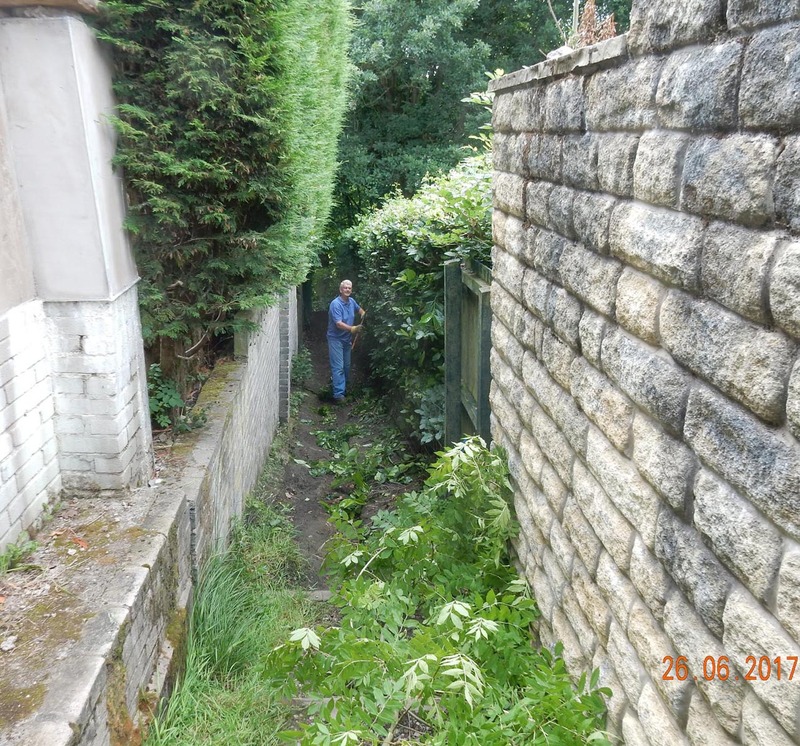 In 18th century Charles Roe formed the Macclesfield Copper Company and worked on the rich ‘Bonsor’ vein in Red Dell above Levers Water taking it below 150ft of the previous German workings. Gunpowder was used for blasting and by 1795 the workings were more than 330ft deep. The company also managed other mines at Parys Mountain in Anglesey and Charles Roe built a copper smelter on Macclesfield Common. 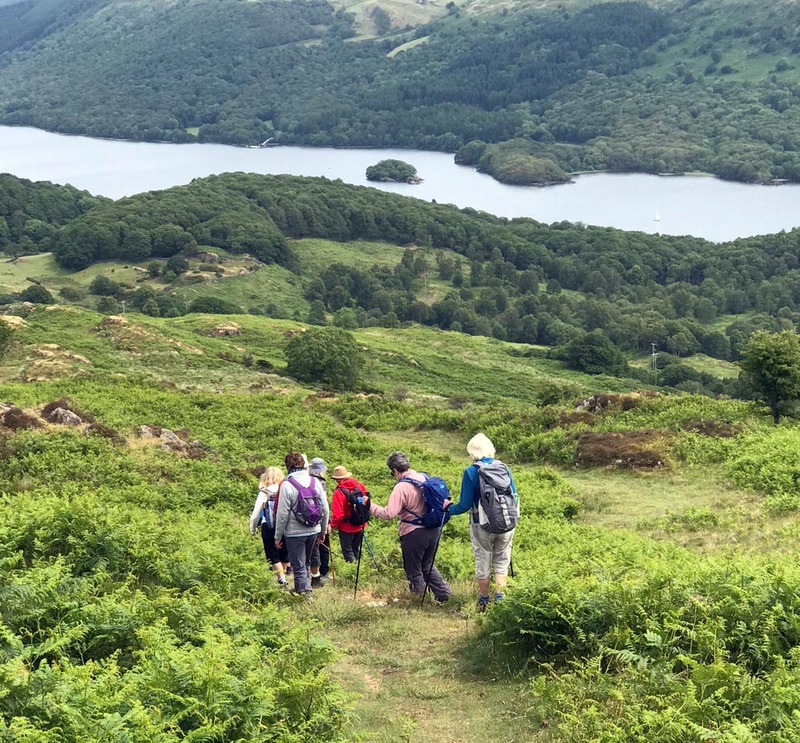 On Sunday, 12 walkers took advantage of the spectacular weather to walk through Coppermines valley and then climb up to Swirl Hawse, Swirl How, Great Carrs and the Wet Side Edge, returning to Coniston via Little Langdale and Higher Tilberthwaite. They covered 13 miles and 2800 ft of ascent. 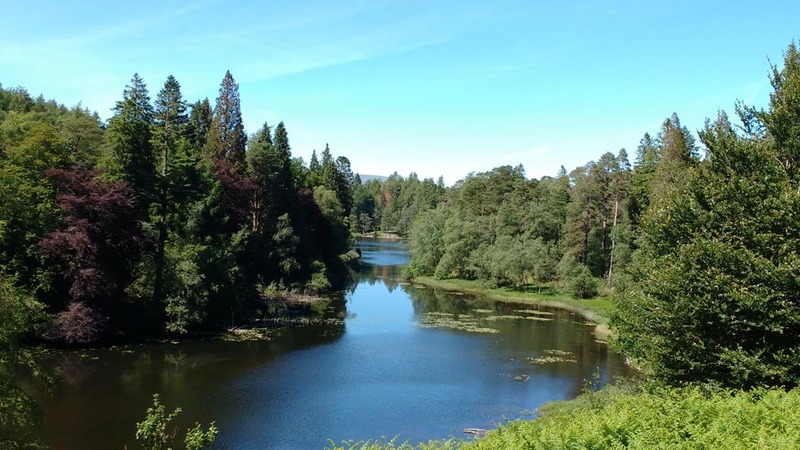 The remaining walkers set off from the main car park at Tarn Hows. Eight walkers did the 8 mile “Fell Sandwich” walk ascending Holme Fell and Black Crag with Tarn Hows sandwiched in-between and 18 walkers did a gentler 6 mile circular walk from Tarn Hows via Low Yewdale Farm, Harry Guards Wood and High Oxen Fell and back to Tarn Hows, where 3 people ascended Tom Heights for the amazing 360o views. Much to everyone’s delight, on returning to the car park, the ice cream van had arrived. Flavour of the day was “Thunder and Lightning”! Couldn’t be further from the weather. What a perfect end to a perfect weekend! This five day break was very different to the Ramblers’ normal trip away and thus I was concerned as to whether it would work well or be fraught with difficulties. I can say that it worked well and everybody seemed to enjoy it. Can I just say that this was the nicest group I have ever had the pleasure of being involved with. Six of us went down a day early to reccie our walks and did eventually manage to stay in the Manor House, no mean feat. On the Sunday the weather was atrocious and did not bode well for the rest of the week. John Handley had to buy an extra layer before he even set off!! I have to say there is no way, under normal circumstances, I would have gone out in that weather. We returned with everything soaked and we hadn’t even started the trip. We did have a good evening meal and chat which made it all worthwhile. We walked on Monday, Tuesday and Thursday with Wednesday off to either visit the area or take part in the wide variety of activities. Golf and tennis were taken up by a number of the group. Evening activities hey, when I discussed this idea with Frank we decided that nobody would be interested but we booked 10 pin bowling on the first night, just in case. Almost everybody turned up and really enjoyed themselves with Dave Gibson being the winner. 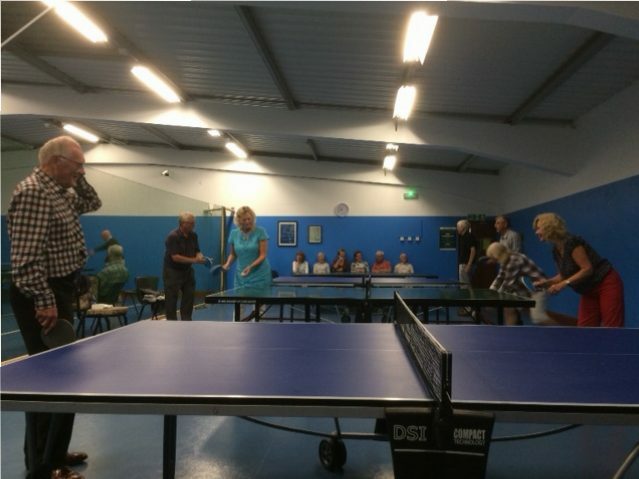 The second night Ruth organised a fun table tennis tournament and again it was a great success. Frank being the winner, perhaps due to many years being spent in the youth club. The third night we were tutored in short mat bowling by Chris and Sue Munslow and again had a fun evening. The final evening there were several things on offer, including a 60/70 night which several people took part in. So not your normal ECR trip!! Frank and I led the Meldon Quarry circuit on the Monday described as “a stunning walk, taking in fantastic moorland fringe scenery with views of the high moors and passing under the striking Meldon Viaduct”. Monday’s other walk was led by Martin who is a walk leader at the hotel, and we started our walk from ‘The Warren’ pub close to Postbridge . Martin was a mine of information (pun not intended) as he told us about the history of mining in the area and of medieval and earlier remains. We looked at areas where miners would stay over the summer and saw where they would have grown vegetables and where they would have had rabbit warrens (hence the name of the pub) to supply meat on site. The moor was beautiful providing a splendid air of isolation and moody rolling views. A short walk was also led with by a leader from the centre. The weather was kind to us and everybody seemed to have had a good day when we met for dinner. Tuesday’s long walk was led by Lyn, another walk leader from the hotel, and we started from Belstone. 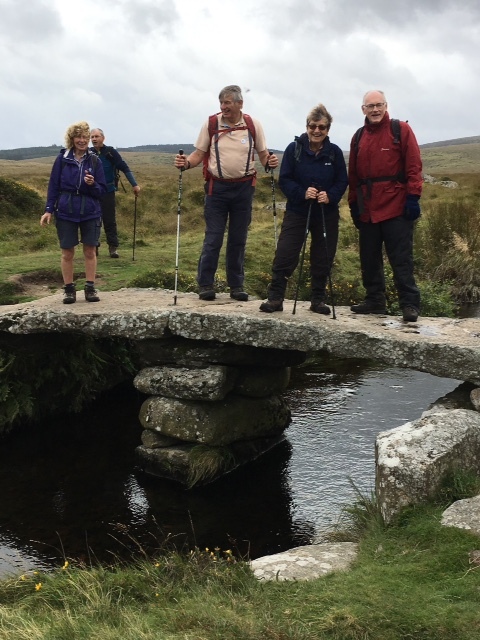 We did an 11 mile tour of the Tors (pun intended) including Hounds Tor, connected to the famous Sherlock Holmes mystery ‘Hound of the Baskervilles’. There was lots of climbing and we had constant rain in the morning, adding up to a tough walk. However, we did not let it dampen our spirits and really enjoyed the 7 tors we climbed, and the views of Dartmoor when we did finally get them in the afternoon. 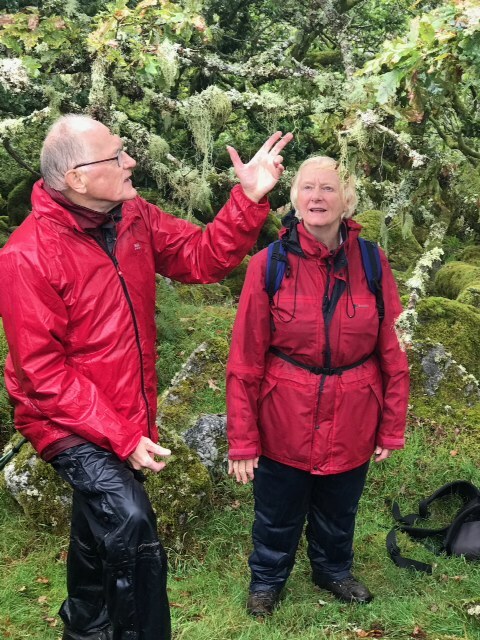 On Tuesday John Handley led a walk to Wistmans wood. What an experience; see his description below. A short walk was also led from the hotel. 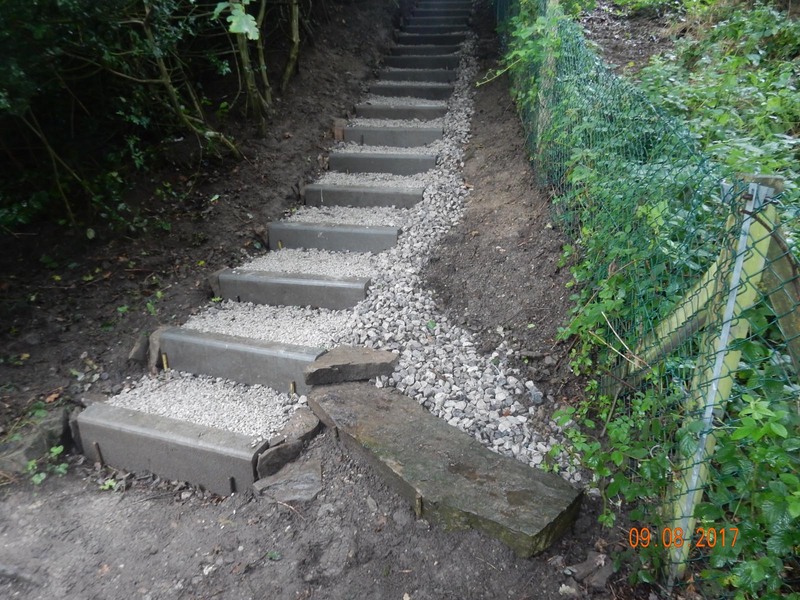 This ‘ecological ramble’ began beside a quarry which revealed the granite architecture of Dartmoor. From here we walked along a rough track into the moor. Beside the track gorse had been burnt to provide a flush of mineral nutrients for the sheep. We reflected on a Welsh saying – ‘Bronze under heather, silver under gorse and gold under bracken’. Next came Crockern Tor, the open-air meeting place of the Stannary Parliament where Devonshire tin mining was adjudicated from the 14th to the 18th century, and where Sir Walter Raleigh himself presided on October 27th, 1600. From here we followed a ridge, each tor more impressive than the last. Less impressive for the sheep. Up here, where the rainfall exceeds 2,000 mm, the growing season for grass is only 175 days compared to 300 days on Devon’s south coast. 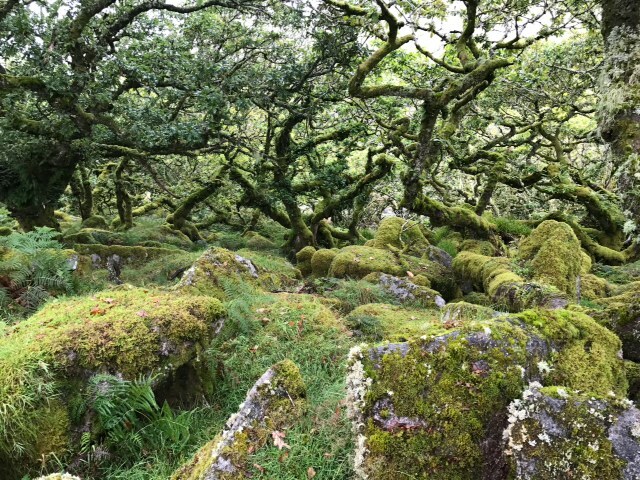 Hence the tree line in western Britain is depressed and Wistman’s Wood at around 400m is one of the highest oak woods in England. It is a vestige of the wildwood that clothed Britain in early prehistoric times. The ancient gnarled oak trees have survived because the granite boulders between which they grow, known as ‘clatter’, are impenetrable to grazing animals – and not much better for ramblers! They are festooned with lichens and ferns and this is a truly atmospheric place. 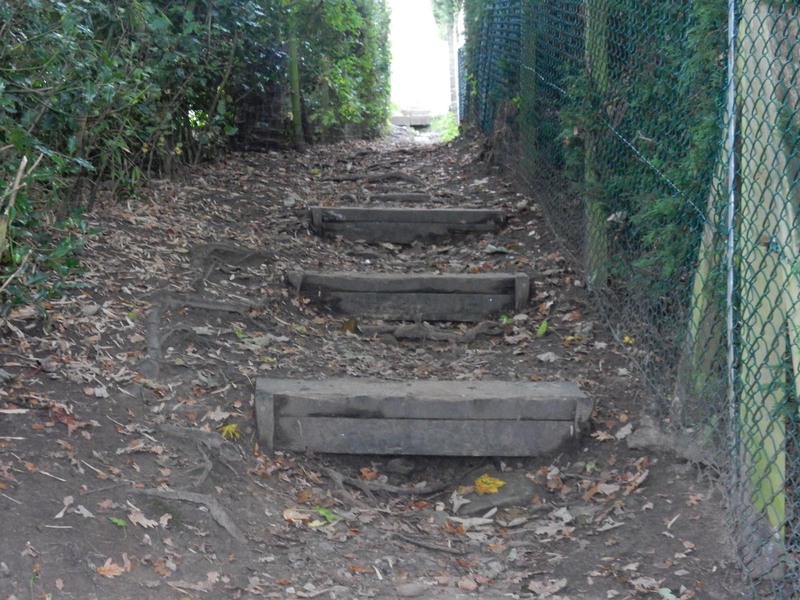 After lunch we followed the Cowslic River to join the Devonport Leat. This beautifully engineered channel was constructed in the 1790s to carry drinking water to the expanding Plymouth dockyards. The leat brought us to the edge of the West Dart valley from where we looked down on Crockern farm. The landscape was grey and drab except for a bright green field beside the farm where animals had been regularly folded. We then looked at the grass beneath our feet and saw that it too was a healthy green and full of herbs. We were standing in a medieval enclosure where the ecological memory went back at least 500 years. Dartmoor may be a forbidding place but its landscape history is something to behold. 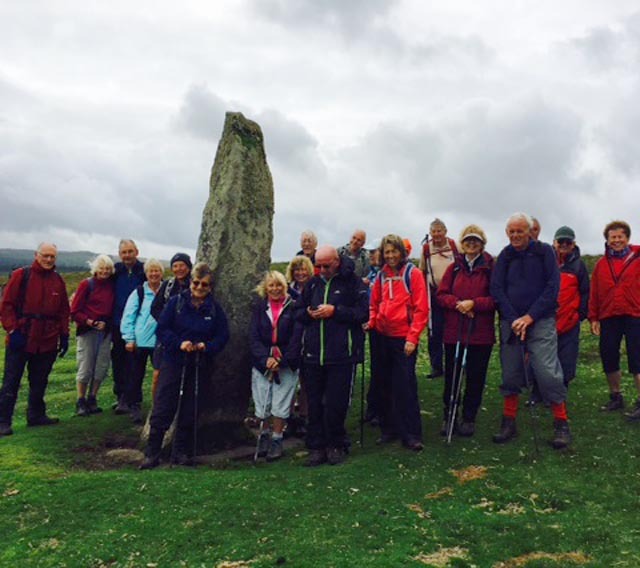 On Thursday 7th September the walk started in the village of Gidleigh. The focal point of the village is the Holy Trinity Church which dates from the late 15th century and nearby are the remains of Gidleigh Castle which is a much earlier building. From the village the route took us southwards through the densely forested area of Gidleigh Tor to cross the cascading Teign River. The path joined the Two Moors Way leading us through flowering pasture meadows of the lower slopes of Dartmoor. At French Beer we left the path walking up on the moorlands and shortly reached the remains of Bronze Age hut circles. Crossing the valley we climbed the slopes up to Thornworthy Tor. Dartmoor is covered with numerous Tors which are the remains of the granite plugs from volcanic activity nearly 30 million years ago. This high point gave us views of the moors and low lying land all round with Thornworthy Reservoir below. Lunch was at another Tor, Kestor Rock. We sheltered from the prevailing wind surrounded by unconcerned Dartmoor ponies and their foals. We headed again for distant slopes towards the ‘Long Stone’, three metres tall with initials carved into one face having a more modern use as a boundary stone. We were now on Shovel Down which has an impressive range of remains dating from the Bronze Age including field systems, stone rows, stone huts, a cairn and the standing stone. 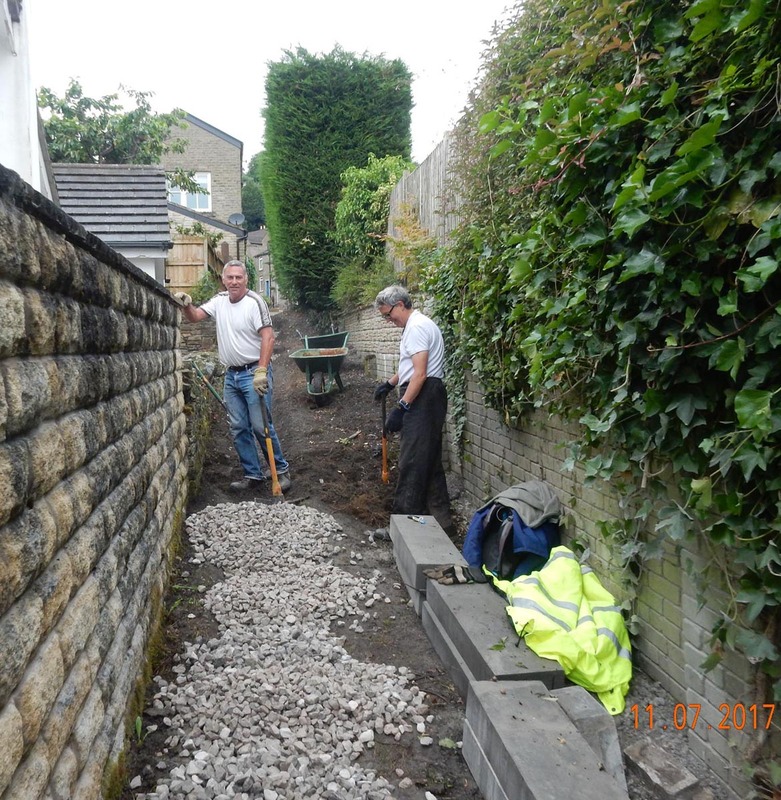 We hadn’t seen stone rows before so they were of special interest to us, being made up of stones which run about a metre apart roughly in a north south direction for a length of up to 180 metres including a Y shape where two rows meet. These may have had a ceremonial purpose. We continued to walk along the stone rows towards an ancient Clapper Bridge then climbing to a higher point where we came across the impressive Scorhill Circle, before returning to Gidleigh. And the rest of our time???? The activities enjoyed by the “Gay” group included: archery, tennis (indoor and outdoor), long and short mat bowling, ten-pin bowling, table tennis, swimming, golf, adventure golf, dancing at a 60s/70s night and relaxing in the hydro spa. Table tennis and bowling brought out the competitive side of many ramblers, creating much amusement for all. 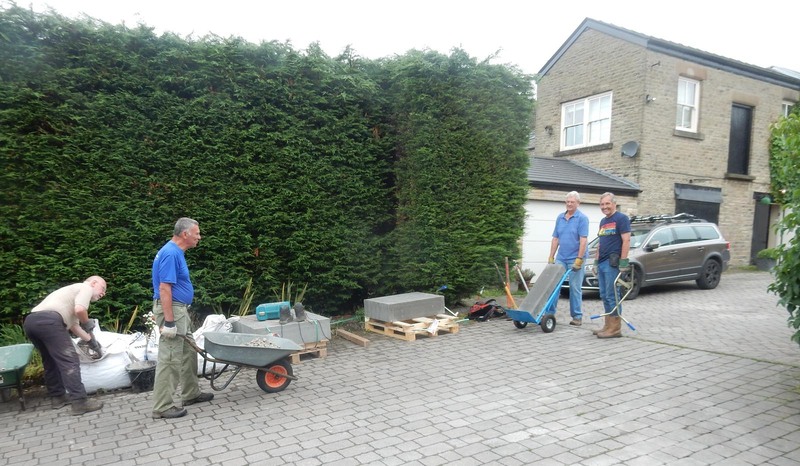 The swimming pools and hydro spa provided welcome relaxation after the walks. Two members of the group didn’t walk but took part in crafts during the day. They sampled enamelling, patchwork and creative embroidery and really enjoyed them, paying about £3 each session for materials used. Pauline tried jewellery making and now is the proud owner of a necklace. This just leaves me to thank Sue and Chris Munslow and John Handley for leading walks as well as Martin and Lynn from the centre. Frank for his support throughout the planning stage and during the week. Also thanks to Louise for the amazing cream tea. Most of all thanks to all who attended for making it such a pleasurable experience. 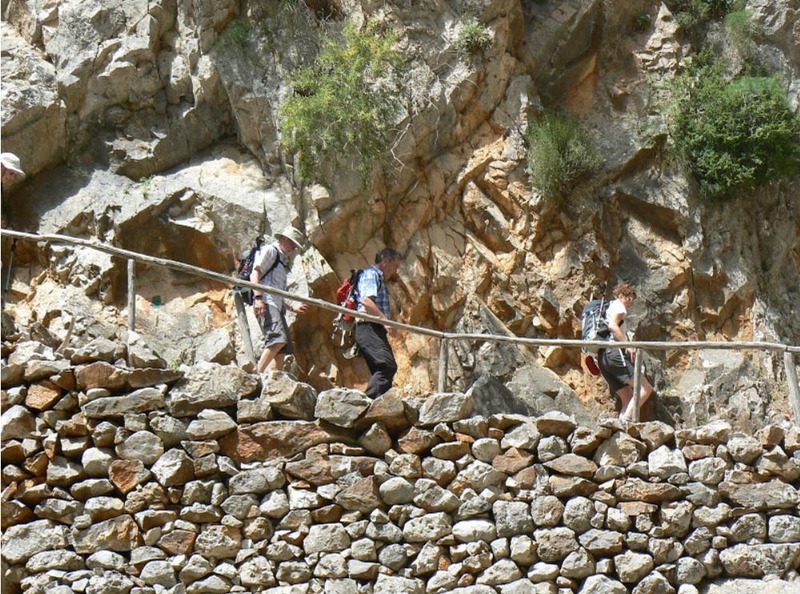 Last Saturday eighteen long walkers returned safely from Crete on the annual continental walking holiday. Based in Loutro on the south coast, we set off westwards on the 1st day to Marmara Bay from where we commenced the 800m ascent of Aradena Gorge.This entailed plenty of scrambling over pretty rough terrain.If people were expecting easier days to come they were somewhat disappointed, as all the walks were what could be described as challenging . Still, all survived ,with only a few tumbles and grazes. 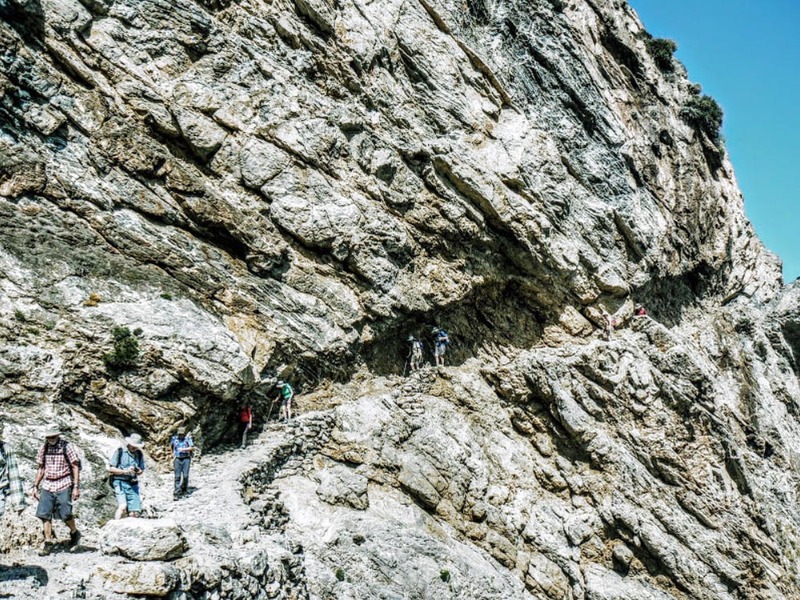 The following day we descended the Imbros Gorge, following the route of the British Army retreat to the waiting warships in 1941.The 1st World War slogan “Lions led by Donkeys” could equally have applied to the campaign on Crete. In fact I’m sure I heard muttering to that effect over the week as I led the group over the difficult terrain.From the bottom of the gorge we walked westwards on the E4 back to Loutro via Sweetwater Beach.Instead of completing the walk with the rest of us Graham Bothwell chickened out at Sweetwater Beach, and caught a boat back. His lame excuse was that we weren’t going fast enough for him.What he failed to mention was that Sweetwater Beach is a nudist beach ! The 3rd day proved pretty gruelling ,involving a water taxi,a 3 hour coach journey,a 5 hour/1200m descent of the spectacular Samaria Gorge,followed by a 1 hour ferry journey back to base. The following day we took a water taxi back to the base of the Samaria Gorge , and walked back along the E4 ,trudging through soft sand 20/60m above the shoreline for the first few miles.We enjoyed beautiful views of the coast and clear blue sea. Graham was delighted to be given the opportunity of returning to Sweetwater Beach for a bit of rest and recuperation on the 5th day. The steep 600m ascent behind Loutro on the final day in mid/high 20 degree temperatures was perhaps the most gruelling of the week, but rewarded with spectacular views of Loutro.It was worth the effort though to descend the narrow ravine that took us down into Chora Sfakion and a well earned lunch (and cold Beer!) in a waterside tavern. 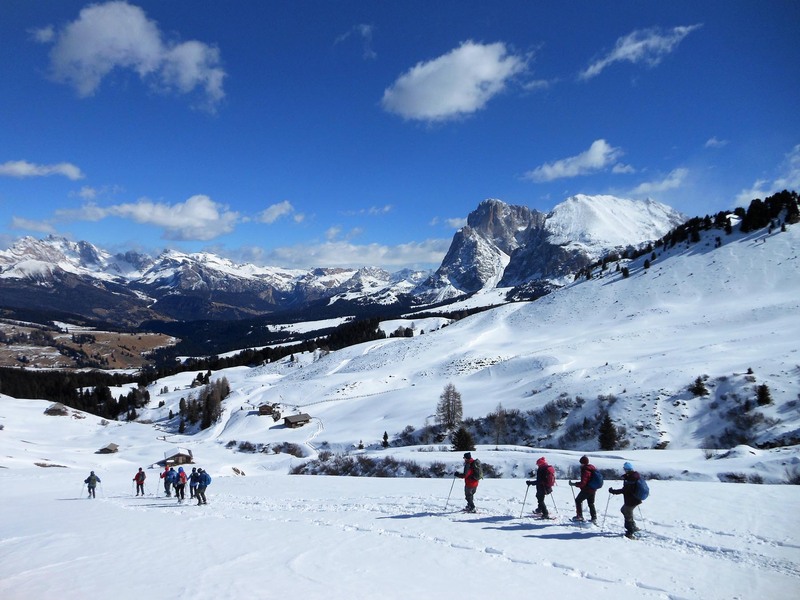 A couple of weeks ago six long walkers enjoyed a week away with Ramblers Worldwide Holidays ,snowshoeing in the Dolomites. 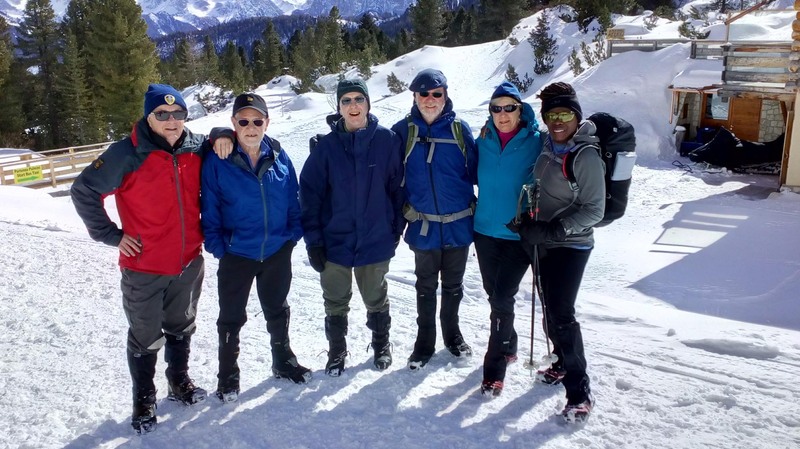 It was surprisingly easy for those of us who had never done it before to adapt to snowshoeing.That said, it was pretty strenuous going at times. Based in the hamlet of St Zyprian we enjoyed spectacular views from the hotel of the Rosengarten limestone peaks. 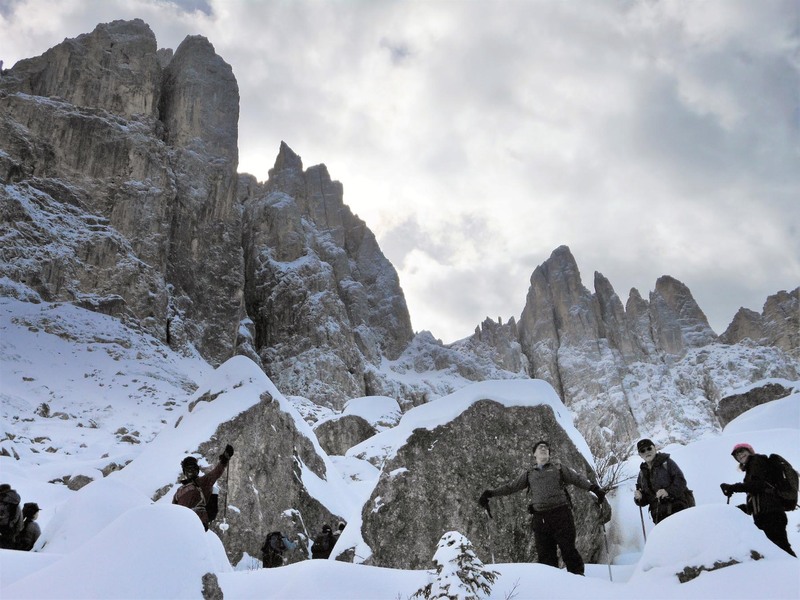 A relatively gentle 1st day was followed by a walk through The Labyrinth,a boulder field of thousands of snow covered rocks.Those at the front were amazed that our local guide managed to navigate his way through.Several days involved journeys by bus and skilifts to get above the snowline to enjoy spectacular scenery,and some of the best walking any of us have experienced. Last day ,and down to a mountain hut for a hot meal followed by a sledge ride back down to the cable car. The final day culminated in sledging 3 kms with a descent of 400 meters:exhilarating !